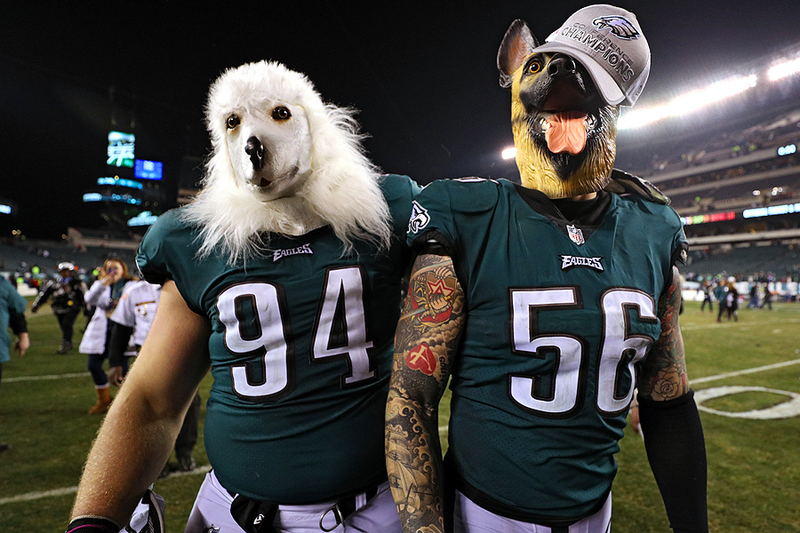 "Beau Allen #94 and Chris Long #56 of the Philadelphia Eagles celebrate with dog masks after defeating the Minnesota Vikings in the NFC Championship game at Lincoln Financial Field on January 21, 2018 in Philadelphia, Pennsylvania." You never know what can happen during a sporting event, unless it happened the week before. During the NFC Championship, the Philadelphia Eagles rolled over the Minnesota Vikings to reach the Super Bowl. The aforementioned was totally unknown to everyone. However, I knew that the Eagles, and more specifically, Chris Long, adorned a dog mask after their divisional playoff win. So I knew to look out for the new trend after the NFC Championship. After photographing the trophy ceremony, I followed Long as if I was a puppy myself. Little did I know he would be joined by a teammate wearing another 'underdog' mask. Always fun documenting something like this in sports. Is it a little gloating on their part? Sure. But is it a fun, telling picture. Absolutely. "NHL Hall of Famer and former Philadelphia Flyer Eric Lindros acknowledges the crowd during his Jersey Retirement Night ceremony before the Toronto Maple Leafs play the Philadelphia Flyers at Wells Fargo Center on January 18, 2018 in Philadelphia, Pennsylvania." As a sports photographer, one never gets to photographer every athlete. Eric Lindros was one of those athletes that I vividly remember watching and knowing about when I was kid. 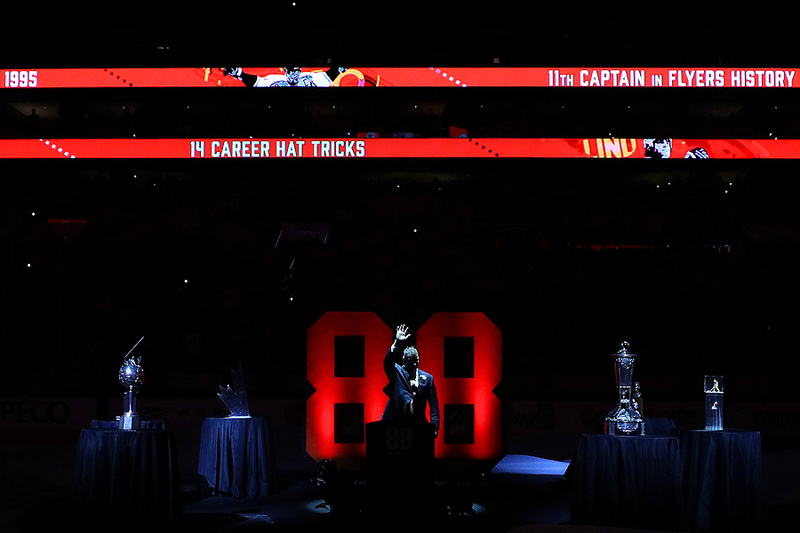 He was a household name and that proves true with his NHL Hall of Fame induction. His style of play was something that one certainly doesn't see in today's game and his leadership meant enough to the Philadelphia Flyers that they retired his iconic eighty-eight number. Having access to the ice for the ceremony, I tried to make something a bit different than the rest, as literal images don't always draw a viewer in. "Markieff Morris #5 of the Washington Wizards crashes into the stands against the Milwaukee Bucks during the first half at Capital One Arena on January 15, 2018 in Washington, DC." I am always amazed how quickly basketball players can slam on the brakes. What I am talking about is their ability to come to a quick stop before crashing into those seated so close the boundaries of the court. Their control is remarkable. Each and every play is full speed and unlike most other sports - the fan base is right on top of them. It's rare you see a player accidentally collide with the media or fans. But when it does happen, it another stroke of genius as everyone is able to protect themselves and come out unscathed. 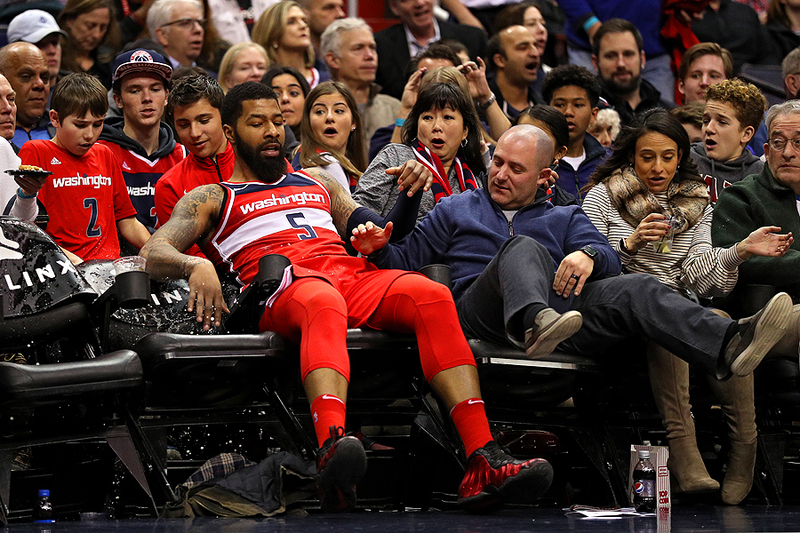 In this case, it was convenient that there was an empty court side seat for Markieff Morris of the Washington Wizards to sit into when he couldn't brake in time. The only casualty were a couple of beers that splashed empty.